I finally visited Rome for the first time a few months ago. And now I'm wondering what took me so long! Oozing with delicious food and tangible Roman history at every turn (even some of the lamp posts and benches are inscribed with SPQR - Senatus Populus que Romanus. The people and the senate of Rome, which refers back to the government of the ancient Roman Republic). I had five wonderful days to explore, packed with history, walking, cycling and gluttony (when in Rome!). I've shared my experiences below, and would love to hear about yours too! Although Rome is traditionally billed as a romantic destination, I found it to be one of the most welcoming and easiest cities to visit as a solo female traveller. Of course I made sure I stayed in a great neighbourhood (Trastevere), safe and close to some great restaurants, I booked my tours in advance and I also did hours of research (which I LOVE doing and hopefully means that you don't have to!). You may also like: my solo travel podcast is now live! When it comes to visiting the major sites in Rome, such as the Colosseum, The Forum and the Vatican City, it's a good idea to do the research to find the best guide, so you can get the best out of your trip. Not all tours of The Colosseum give you access to the underground areas (which, for me were the most fascinating). After a lot of research, I chose Walks of Italy. Mainly due to the excellent reviews. For me, visiting this breathtaking arena of ancient Roman history may be a once in a lifetime experience, so I wanted to make the right choice. I chose the 'VIP Colosseum underground' tour, which also took in the Roman Forum and Palatine Hill. All in all the whole walking tour took around 3.5 hours (so remember to take water, snacks and sunscreen). The small group (there were around 12 of us) had an excellent guide (with a brilliant sense of humour!) and were given headsets so that we wouldn't miss a thing. I would also say that although the tour lasted all morning, I never once felt rushed, and I was free to walk at my own pace, which is handy when the day heats up. Bonus country! The Vatican is another country you can add to your list. It's the smallest in the world (with a population of around 1,000), and has it's own government, with The Pope as the head of state. Although it has no official army, The Swiss Guard is a military corps (with snazzy uniforms), who are responsible for the safety of The Pope. Soldiers of The Swiss Guard can hold Vatican City passports. The tour includes St. Peter's Basilica, The Pieta and The Sistine Chapel (where photography is strictly forbidden). And despite going on a mid-week, morning tour, by the time we reached The Sistine Chapel, it was shuffling room only, a room full of craned necks staring at MichelAngelo's masterpiece. Tip: On Wednesdays, due to the papal audience in the morning, you can only do the tour on an afternoon. The Vatican tour includes the gallery of ancient Roman sculptures. The reason I've paired these sights together, is because for me, they felt quite similar in that they were both super busy tourist spots and something that you can spend just half an hour in. They are also only about a ten minute walk apart from each other. The Trevi Fountain is undoubtedly impressive, and such a fun photo opportunity, but (and call me a philistine), I also kinda felt like I was looking at an over-the-top garden water feature in a footballer's back garden. But don't let that put you off. It's a good place for a pit stop. The Spanish Steps offer some great views from the top, plus the chance to stop by at the Keats and Shelley writers museum. One of my favourite days in Rome was spent cycling the Appian Way. Not everyone who comes to Rome visits the Appian Way, (which runs for 400 miles, all the way to Brindisi, in the heel of Italy's boot). It's a wonderful way to escape the city and explore more of Rome's rich history. Sights along the way include visiting the ancient underground Christian burial chambers of the catacombs, taking a lazy lunch amongst orange groves, and cycling along one of the oldest roads in the world (dating from 312 BC). It is also the scene of the crucifixion of 6,000 rebel slaves, led by Spartacus, who were finally defeated by Crassus' army in 71BC. To get to The Appian Way, take the 118 bus from Circus Maximus , and get off at Appia Antica/domine Quo Vadis (this is probably where most of the passengers will alight) but make sure you don't miss the stop - like I did, otherwise you will need to catch the bus back as the next stop is too far to walk. EcoBikes cycle hire were super helpful and kitted me out with a bike and a map, highlighting the sights along the way. The entrance to the start of The Appian Way was just opposite. And as soon as you're on this beautiful road, you feel like you're in the Tuscan countryside. If you can go midweek, in low season, it will be quiet and you may have entire stretches to yourself! One of the first important sights along the way, are the catacombs of San Callisto. Dating from around 150AD, this Christian burial site, stretches up to 20km long, and houses the remains of martyrs, pontiffs and civilian Christians. You don't need to book tickets in advance, just turn up and sign up for the next available tour in your language. The tour lasts around an hour. After all of that subterranean exploration, you may need a bite to eat, and I chose Il Giardino di Giulia e Fratelli, with simple gingham tables beneath shady orange trees. When I arrived there was a long table of Roman friends sipping wine, who looked like they had been there all day (maybe they had?). And the owner was so lovely that he insisted on showing me the best spots for a photograph in the gardens behind the restaurant. 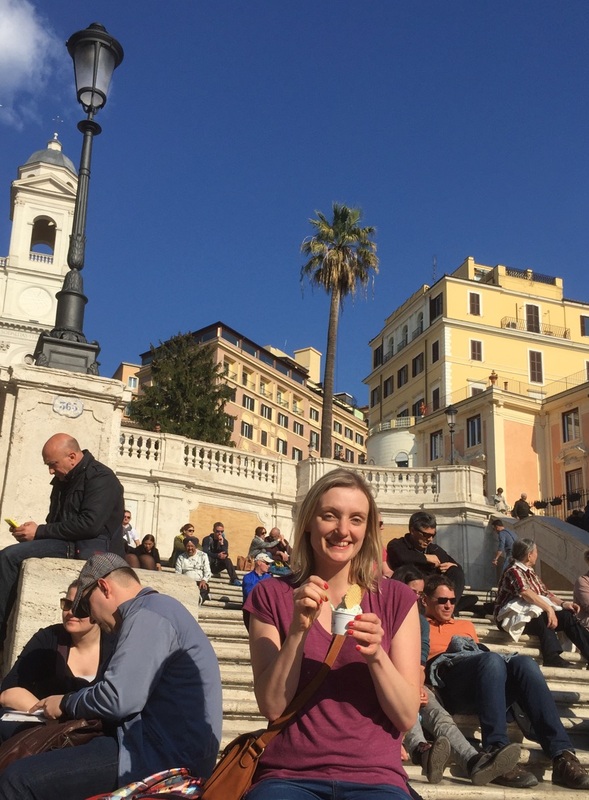 A bowl of pasta is my go to comfort food, so I was truly in my element in Rome. And of course, in the name of research I tried a LOT. 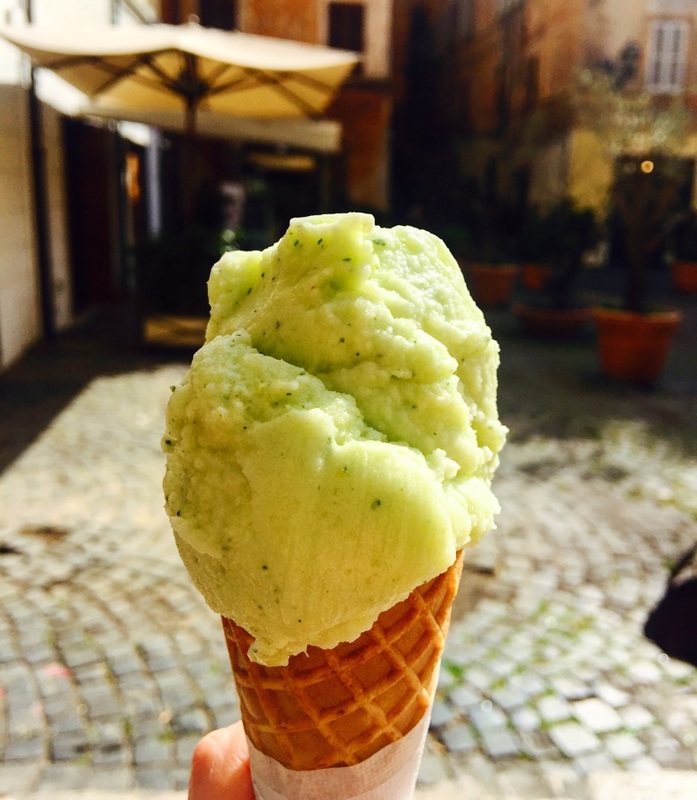 I also tried copious amounts of Pizza, gelato and even offal, to try to find my favourite Roman fare. I've noted down the best ones below. This is a no frills bustling pizza joint where the over worked waiters could literally not give two sh*ts about you. Find your own table, and order the zucchini flower pizza with a side of Supplì. The cramped tables will have you dining with baffled tourists and loyal locals. Absolutely delicious. God bless Italian gelato. This busy spot has such a good reputation, that you will have to queue for a while on a sunny day, but it is SO worth it. I had the pineapple and mint. A perfect cooler after all that sightseeing. The atmosphere in Ombre Rosse was amazing. 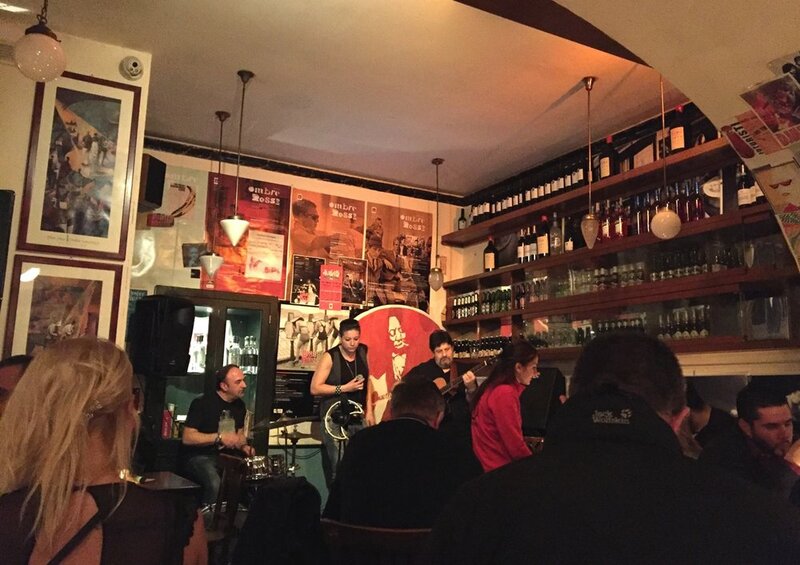 Live music and the most laid back, friendliest waiters. I cozied up in the corner and ordered spaghetti cacio e pepe (a simple Roman dish and a must-try in Rome), and a glass of Pinot Grigio. I was unhurried and took my time over my Tiramisu, washing it down with a complimentary limoncello whilst I watched the excellent band. A good rule of thumb for Roman restaurants, is that the more spartan the decor, the better the food. And this is definitely the case for Da Augusto. Most of the shared tables seemed to have more locals than tourists, a bit like Ai Marni. I was seated with a Roman family (who kindly helped me out with my pretty abysmal Italian) This was possibly the most delicious (and cheapest) meal I had in Rome (I had the rabbit, after a recommendation from my lovely table fellows). Another key dish to try in Rome, is Pasta Amatriciana (cured pork, pecorino and tomato). I tried this a couple of times in different spots and Taverna Romana's version won hands down. Again, this was a bit hit and miss for service (maybe that's another sign of a good Roman restaurant!? ), but divine authentic food and a cozy family atmosphere. • In need of a quick caffeine fix? Drink your coffee standing up at the bar. • Order a SINGLE espresso after dinner or lunch in Italy. • Try Caffe’ e ammazza caffe’ (translates as Coffee and coffee killer), which is a digestive drink like limoncello or any strong liquor that helps aid digestion.